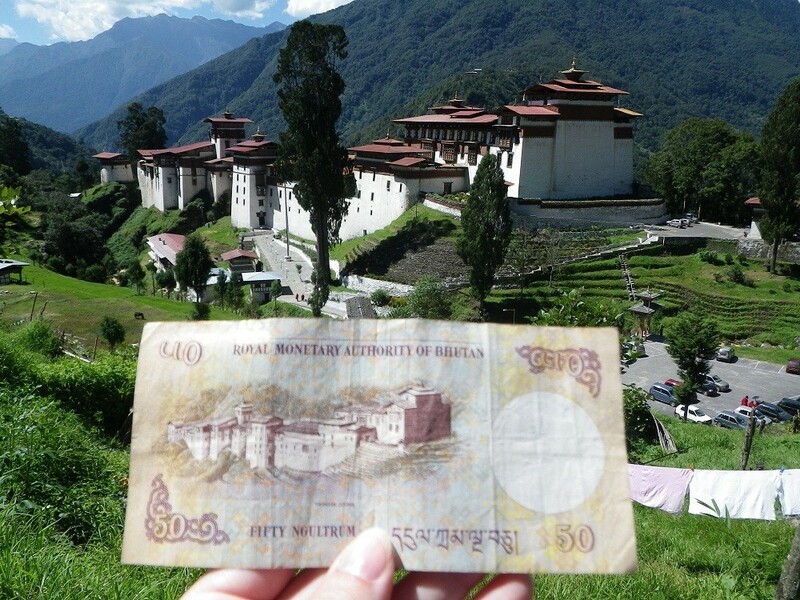 Update: THANK YOU Korice Moir for taking and sending the above pic of Trongsa Dzong and the 50 bill! 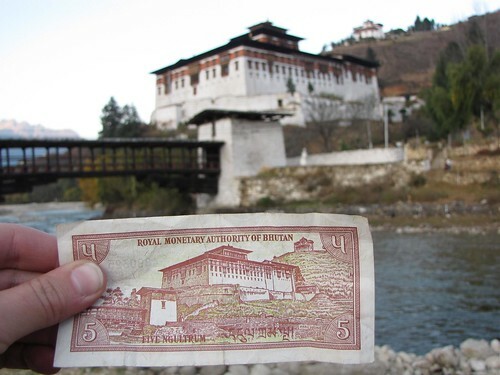 Update: THANK YOU Korice Moir for taking and sending the above pic of Punakha Dzong and the 500 bill! 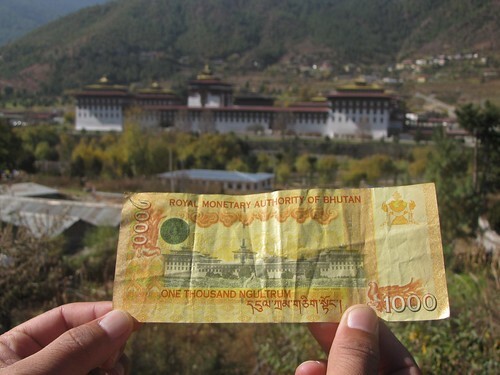 1000 Ngultrum note and a different angle of Tashichhoe Dzong. The 1000 is a somewhat rarer bill and I could only get a hold of this crumpled one! Incomplete sets are so very unsatisfying. I didn't get back to Trongsa or Punakha after I had the idea to do this photo series so I'm left with only 5 out of 7. But, perhaps you can help? 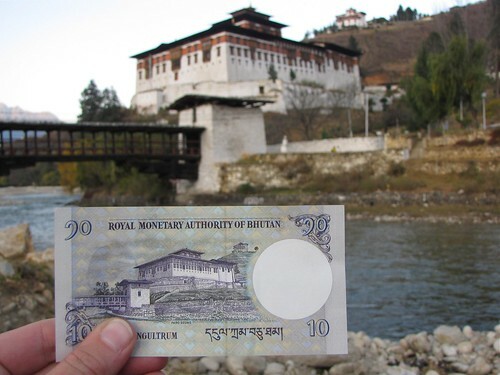 If you are in Bhutan and you can take the 50 or 500 Ngultrum photos in this style, send them along so we can finish the set! Here's the older 5 Ngultrum note and Paro Dzong. I think is the best of the photos. 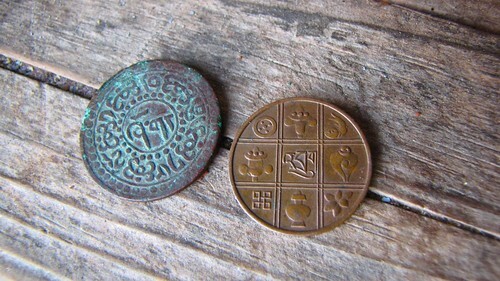 Coins are now out of circulation in Bhutan but here are two that a friend collected. - For bringing money in, cash is the way to go. You can change your cash into Ngultrum at the airport exchange counter in the same room where you'll pick up your luggage. Do it then to save a trip to a bank later. Bills in the major currencies will be accepted (US, Euros, Pounds Sterling, Canadian dollars, Australian dollars, Hong Kong dollars, Singapore dollars, Rupees and such). You will get a better rate for larger bills (i.e. $50 and $100 notes). Ask to get some smaller bills in your bundle from the exchange counter. - Despite contradictory information being given out by the banks themselves, only American dollar travelers' cheques can be cashed at major bank branches without a huge amount of commotion and trouble. Take it from someone who knows. Even Lonely Planet got this wrong. - As of late 2010, there is an ATM in Thimphu which takes MasterCard. There have been some technical problems, though, so if the machine is out of order on the one day you're in Thimphu, you're out of luck. Don't rely on using your MasterCard. - Regular escorted tourists will only need enough cash for extras like souvenirs, booze and tips. However, if disaster strikes, or if you see a work of art you cannot live without, you could make use of the Western Union money transfer service through Bhutan Post. 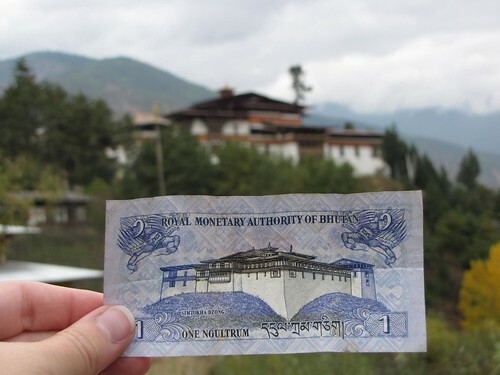 - If you've arrived via India, you'll be fine using Rupee notes for everything. The Rupee and Ngultrum are at par. 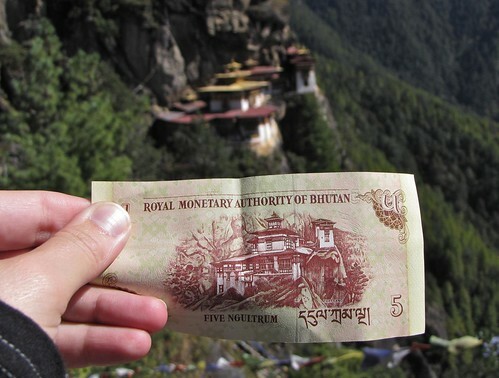 - Try to keep a few lower denomination notes aside (10s, 50s, 100s) to leave as offerings at the altar or in a donation box whenever you visit a shrine or a temple. They can really use your contributions. Foreign money is so beautiful. I think currency issues make me more nervous than anything about traveling abroad. I'm terrified of getting confused and ripped off. This is such a great idea! I love that you made the connection between the money and historic places and knew where they were. 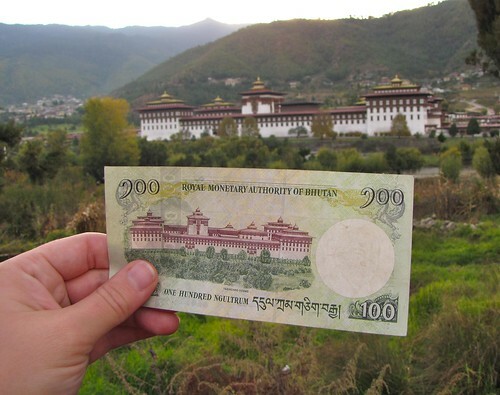 I probably would have just looked at the money and kept travelling!